Due to the nature of this particular domain with its unique and authentic objects, this requires a special mentality in thinking and manipulation of the people involved in the development and production of the equipment for restoration and conservation. The people of JEZET work and think according to this mentality now for over 40 years and not only that, they developed special techniques, systems, and production machines, that meet the specified standard. In reality, especially in the past, this often meant to build the required production machines in own regime, according to even higher standards, the not so long ago introduced CE and/or ISO standard, which only work on the basis of new products and new production processes, not at all of old authentic objects. In general, not only the products themselves, used for the restoration and conservation, but also the manufacturing process, the production machines, devices, treatment and even the method of packaging and transport are all in function of the unique and authentic objects, so there's no chance in any stage or shape on damage, deterioration, dissolution or even destruction. The special demands on the people involved in the actual restoration, the restoration workshop, such as the preservation and simultaneously to meet the special object treatment, product implementation, safety requirements for the technical implementation and security requirements for each country, including the CE standards. The JEZET engineers work a concept for each individual situation for that particular unique, original Object or Objects, along with the restorator up to a final form, that the specific treatment can do. What can be a simple hand instrument, a device with only one function, a multifunctional machine to an installation with a fully automatic operating system. Executed in only inert materials such as Aluminium, Stainless Steel, Polycarbonate and hard Polyethylene, depending on the nature of the application, the need for the kind of treatment or conservation of the unique, original object. Indissoluble connected to each other, because a bad storage immediately leads to decline and that returns a necessary restoration. 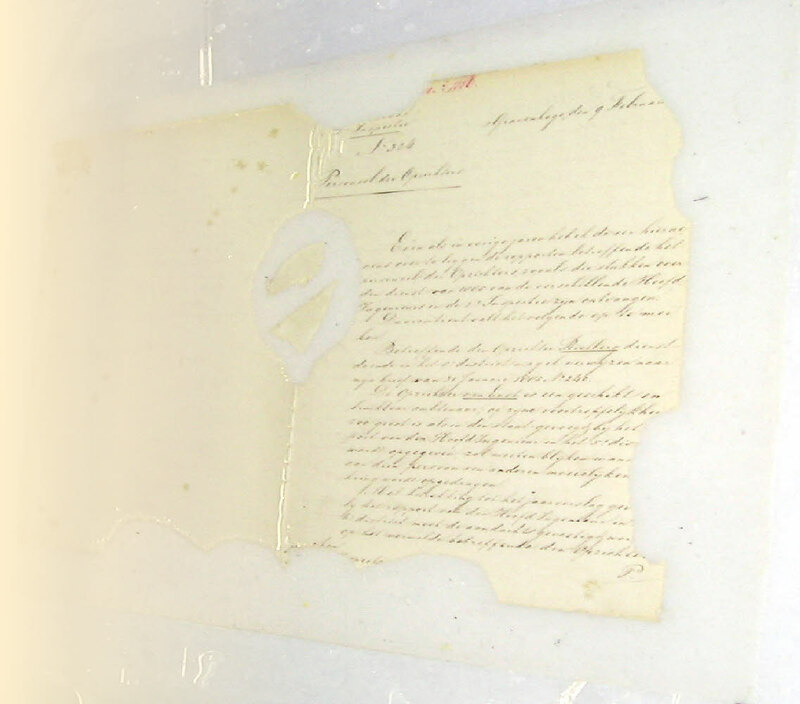 Even if documents are kept in a poor state, without firstly carrying out a sufficient and effective restoration. What causes this binominal unity? Archive documents or objects, which are stored in non-conditioned depots, can attain within the shortest possible time in a visible decline, by contamination, damage by UV radiation, dust, riot damage, environment and climate damage, accidental damage such as fire and water damage, infestation, fungi, bacteria, use damage, but also the damage caused by the material itself, such as acidification, dissolution, ink damage or just aging. There should always be taken into account calamities, no matter how small, that may occur and expand, with that increase the chance of irreparable damage. Preservation in specially for this purpose built climate-controlled depots, such as new constructed buildings, is the probability of a part of the damage of course less, although note should be taken, that it are precisely these climate systems are the cause what often be the source of the spread of fungi and bacteria. The most ideal form of preservation is flat, single, protected from dust, UV, vapours and especially use damage. For example, many documents, files, archives, charters, maps, photos, books, textiles, flat objects in the archives, libraries and museums kept in the drawer cabinet system PLANORAMA (designed by the engineers of JEZET and now produced by Conservation by Design Ltd. In Bedford, England), where the objects of different material, shape, size, diameter, etc. can be grouped into easily dismountable aluminum cabinets or modules. To preserve in drawers with an internal height of 10 up to 630 mm which divergent can be adapted to the different objects with respect to size, inert base material and fixation. Restoration of objects can be split into two forms, an ethical or invisible recovery and a legal or clearly visible restoration. A restoration treatment may be performed on multiple ways: by hand, but nowadays increasingly more mechanical, of only one single treatment up to a subsequent pattern of treatments. The final decision is always in the hands of the Restorer, to decide: which object, which part, what treatment by hand or mechanically, with what kind of resources and at what time dot. The same applies to the result of a restoration, which depends only on the skills of the Restorer and to a lesser extent of tools and/or machines. The philosophy that pursues JEZET is to always go out of the original, authentic object, and the good part of the object intact and to do only those treatments, which there is absolutely no damage, reduction or irreversible change occurs to the original good part or just to carry out only that treatment, which is necessary to keep the object in a particular condition to prevent a further deterioration and allows in a later stage to perform a full restoration.